Moerstraat 23, 8000 Bruges, Belgium. 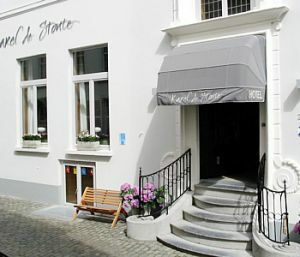 Hotel 'Karel de Stoute' is a charming, peaceful 3-star family-run hotel situated in the historic heart of Bruges. It is the original 15th century city-palace of the Dukes of Burgundy in Bruges. The hotel dates back to before 1400 with the authentic structure and elements from the Burgundian time still in place. The hotel is on the Flemish Heritage List due to its unique historical value and used to be in the garden of the Prinsenhof-site in Bruges. This hidden medieval gem of Bruges lies just off the main squares but is situated in a quiet neighbourhood. Today the hotel is known for its hospitality and personal attention to the guests. Near trainstation, Park, Centre, Museum Area, Near the historic centre, Near shopping centre. More than 2 days before arrival : no cancellation costs. Less than 2 day(s) before arrival : Entire reservation will be charged. When the reservation has not been used and no cancellation has been made at the hotel: the first 2 nights will be charged. Pets are allowed free of charge. A succulent Flemish buffet-style breakfast is served in our hotel with a friendly personal touch in an authentic room. This will be an excellent start of your day in Bruges, that can be concluded with a drink in the vaulted cellar bar of the hotel. From morning in Bruges until night you will always savour the homely atmosphere in our hotel. LOCATION! Everything in Bruges is close to the hotel: restaurants , landmarks , shopping streets, public parking. The hotel can be reached by car but it's a residential street with priority to pedestrians. 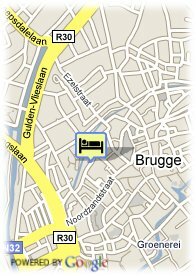 Distance to the Market of Bruges( central square) : 300 m, to 't Zand : 400 m, to Church of Our Lady : 700 m. Walking from the train station takes 15 minutes. Nearest public parking : 400 m.